Tiger Barb is a variety of cyprinid types of fish that comes from the Cyprinidae family. These fish breeds are farm raised verities from the United States, and they are largely found in clear or muddy low waters of moderately flowing rivers. The Tiger Barb is an extremely energetic, playful fish that likes to be in schools at all times. In the aquarium, these fish breeds prefer soft, somewhat acidic water, with the temperature ranging from 74 degree Fahrenheit to 79 degree Fahrenheit. 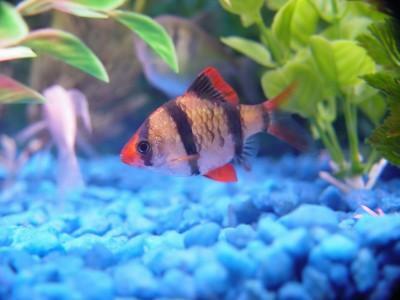 The Tiger Barb fish breed is a semi-violent variety of fish that has a maximum body length ranging from 2.75 inches to 4 inches, with the breadth of 1.18 inches. They come in different body colors, such as orange, black, yellow and white, according to different varieties among them. They are also found with silver or gold colored body with black lines and orange pronounced fins. Tiger Barb fish varieties prefer a well-planted aquarium with a minimum capacity of 30 gallons with soft, a little acidic water. Driftwood and rocks should be incorporated to the aquarium for shelter and hiding purposes, and they prefer a lot of space for swimming. This fish variety is extremely active, and may harass or even pinch the fins of bigger, slower moving fish varieties. The Tiger Barb fish verities are omnivores, and they are fed with meaty foods and vegetables. They are also fed with flake foods, including frozen and live foods, such as bloodworms and brine shrimp. Usually, the Tiger Barb fish gets sexual maturity when they attain the body length between 0.8 inches and 1.2 inches, or when they attain the age between six and seven weeks. The female breeds are bigger than male breeds, with a rounder stomach and have a black-colored dorsal fin, whereas the male breeds have a vivid, red snout with a different red stripe above the black-colored dorsal fins. Usually, spawning takes place in the early morning and the female breed lays more than 300 eggs and it deposits them in plant bunches. Spawned eggs of the breed are adhesive, negatively floating in freshwater, with the average diameter of 1.18 mm. The average lifespan of the Tiger Barb fish breed ranges from 5 years to 7 years.